and many other diseases of the eye. The lens structure in the eye, focuses light rays on our retina. If the lens structure becomes cloudy the lens is called a cataract and light is unable to focus properly on the retina. Typical visual symptoms include: blurry, cloudy, or dim vision; also objects do not appear as bright or colorful. Surgery is the only treatment for cataracts, no medications or eye drops can make cataracts disappear. A complete eye exam will help determine if a cataract is the cause of vision changes. The optic nerve is a structure, like an electric cable, made up of many wires sending signals from your retina to your brain where signals are interpreted as the images you see. Glaucoma is a disease that damages this structure (optic nerve) and can cause blindness if left untreated. Its estimated that three million Americans have glaucoma and only half are aware they have the condition. Glaucoma is a silent disease and can damage your vision due to the slow progression of the disease early symptoms are not common. 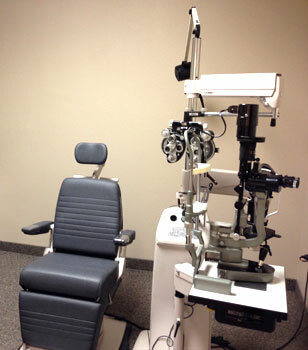 It is important to manage and treat this condition with routine comprehensive eye exams. The macula is a very sensitive part of the retina, and it allows you do activities with your central vision such as: thread a needle, read small print, and read street signs. As the eye ages it can delveop a condition called macular degeneration. The symptoms with macular degeneration include: blurriness, dark areas or distortion in your central vision, and perhaps permanent loss of your central vision. Macular degeneration can be detected on regular comprehensive eye exams before the disease causes vision loss. If treatment is necessary it can slow vision loss, but it does not restore vision. The most common diabetic eye disease is called diabetic retinopathy. The tiny blood vessels in your eye are effected by diabeties and the blood vessels can swell and leak fluid, sometimes the blood vessels can close off completely. In early stages people with diabetic retinopathy do not notice changes in their vision until further progression. At times, diabetic retinopathy can cause vision loss that may not be reversible. Continued care with routine eye exams and follow up with general physician will greatly reduce possible vision risk. Your tears, or tear film, is complex and fragile and made up of three different layers: oily, watery and mucus. Everytime you blink this tear film spreads over your eye giving you clear and comfortable vision. If any balance of the three tear film layers is not functioning properly, you may experience: blurry vision, burning sensation, foreign body sensation or pain/irritation. By visiting the eye doctor, your dry eye concerns can be addressed and proper treatment, if needed, can be started. A triangular-shaped growth in tissue that extends from the white part of your eye over the cornea (the clear front window of the eye) is called a pterygium and is thought to be caused by ultraviolet light from the sun or other environmental factors. This growth is noncancerous and common, but can cause irritation such as: blurry vision, burning sensation, foreign body sensation and redness. Visit your eye doctor for further information for treatment of this condition. The vitreous is the fluid that fills the majority of the inside of your eye. When viewing a plain background, or blue sky you sometimes see small specks, dots, circles or cobwebs moving in your field of vision. These small specks are floaters, tiny clumps of material inside the vitreous. As the eye ages it is common to experience floaters and flashes. Flashes occur when the vitreous pulls on the retina. It is important to contact an eye professional if the following symptoms arise: sudden increase in size and number of floaters, a sudden appearance of flashes, a shadow or curtain in vision, and a sudden decrease in vision.